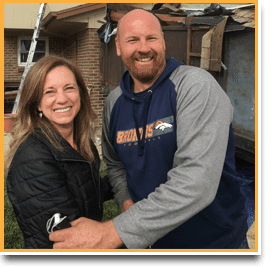 A career in Denver Roofing Sales can be incredible. There is a financial opportunity to change your life. The reason roofing sales is such a great opportunity is that the funding for the sale is often provided at (almost) NO COST to the buyer. When a home or building owner gets a new roof, it is very often (not always) paid for with insurance proceeds. The money for the new roof is often already available from the insurance company. Because of this, your customer is not highly concerned about how to pay for the new roof since it’s insurance proceeds covering most of the cost (less their deductible). This is highly unusual in most sales jobs. The price for the new roof is mostly settled by the insurance coverage – it’s not highly negotiable – unless they would like upgrades or other services outside the roof replacement. Your customer’s greatest concern is that they choose a really great roofing company that is reputable, does excellent work and has a body of evidence to prove it. The work is being done to their home. It’s personal. This is an opportunity for them to upgrade their home with a new look or color or style. Picking the right company, the right roofing expert, is the highest consideration. Therefore, New Roof Plus must deliver for them. We have to be great every time. We need to be knowledgeable, we need to be trained, educated, friendly, likeable, honest and people of integrity. We want them to have a great experience and know that they made a good choice in choosing us. These are the most fundamental attributes of a great roofing sales person. You must convey the high ethics, expertise and standards New Roof Plus delivers to each and every customer. There is an exciting career track that is available right now at New Roof Plus. We are a young company and we need good people who can help us grow. Our company’s most important focus is doing great work for customers to build a legacy of success. A 5 Star review is our goal with every project. Our legacy of success will come by us attracting and developing great people. Our focus is to provide a place to work where good people love to work, are proud to work, and get excited to help home and building owners achieve their goals. Success and job satisfaction come when you are helping others in a healthy workplace environment. New Roof Plus is currently seeking a qualified and experienced roofing and exterior sales person. A bonus would be if the applicant has 5 or more years experience with references. We prefer sales personnel with certifications in roof inspecting for both residential and commercial applications. The greatest attributes we seek in our people is integrity, intelligence, a willingness to work hard for success and a strong passion to make the customer very happy with New Roof Plus. Please fill out out our “Contact Us” form if you are interested in talking with us about this opportunity and we will be in touch with you. Thank you for your interest in New Roof Plus!